Andalusian/Lusitano crosses can be registered as Andalusians with the IALHA(International Andalusian & Lusitano Horse Association). 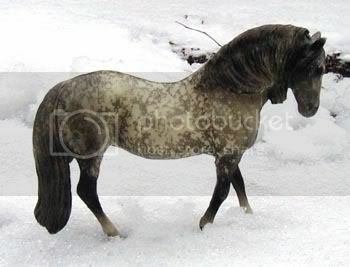 However, all my Andalusians are Pura Raza Espanol(PRE), or Spanish studbook only. I will allow crossbreeding to Lusitanos(PSL), but your horse will only be considered "purebred" in the IALHA registry. It will NOT be a PRE Andalusian. Lines to Don Marco, Leopardo II, Legionario III, Temerario V, Emperador, Caprichoso S, Ofuscado II, Senorito XXV. Sire is a multiple live and photo show champion. 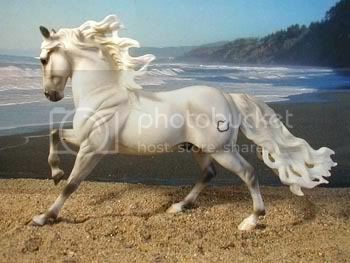 Model information: Breyer Andalusian mold; "Della Robbia", Christmas special run for 2005. 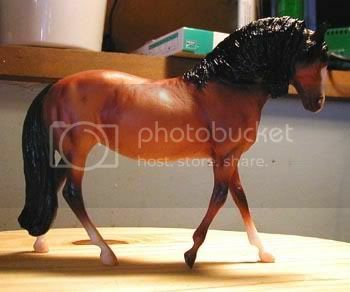 Model information: Breyer Legionario mold; "El Campeador", 1995 West Coast Model Horse Collectors Jamboree special run, 875 made. Lines to Don Marco, Leopardo II, Legionario III, Temerario V, Caprichoso S, Ofuscado II. Sire is a multiple IPABRA Top Ten and champion on the European live show circuit. 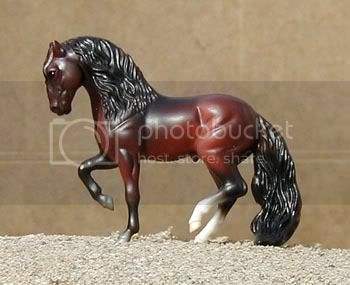 Model information: Breyer Stablemate scale G3 Andalusian mold; "#5906 Andalusian", produced 2006-current. Sire is a photo show winner and was sired by a multiple champion, Dam is photo show placed. Lines to Adalid, Legionario III. Model information: Stone Chips sclae Andalusian mold; regular run. Dam is a Grand Champion. Lines toGenio III, Bravio XVI. Model information: Breyer "Legionario III" mold; #851 Spanish Pride, produced 1991-1992. 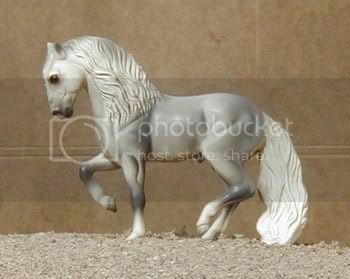 Model information: Breyer Stablemate scale G2 Andalusian mold; #5606 Andalusian, produced 1998-2000. Sire is a photo show Champion. 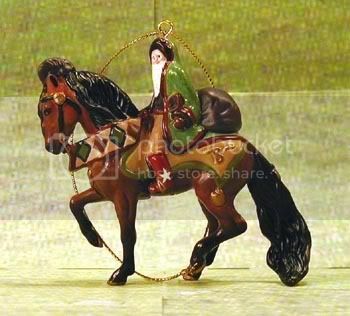 Model information: Breyer Stablemate scale Andalusian Ornament mold; #700113 Father Christmas Ornament; produced 2003. Sire is a photo show Champion and Reserve Champion and a MEPSA National Top Ten; dam is a photo show Champion. 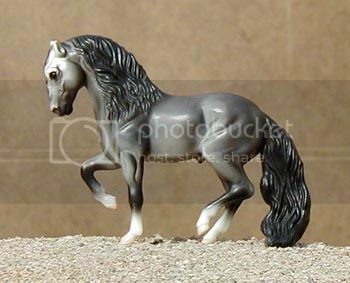 Model information: Breyer "Legionario III" mold; #701599 Grane of Gotterdammerung, special run for the 1999 Equitana USA event, 2,000 made. 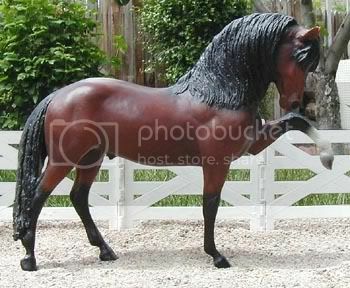 Model information: Breyer Stablemate scale G2 Andalusian mold; #5904 Dark Bay Andalusian, produced 2003-2006. Lines to Leviton, Ebano, Genil. Both grandsires are photo show winners. 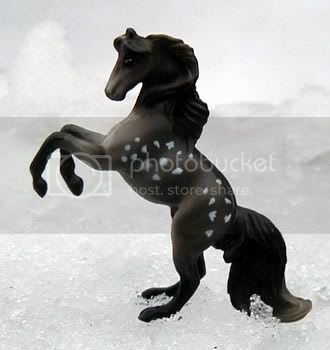 Model information: Breyer Mini Whinney scale rearing horse; Mini Whinny Stallions set, produced 2005-current. Lines to Leviton, Ebano, Carinoso III. Sire is photo show placed and dam traces to multi-champion model-bred lines. Awards: Previously NAN qualified, photo show placed, has achieved Superior Champion status with IMEHA. 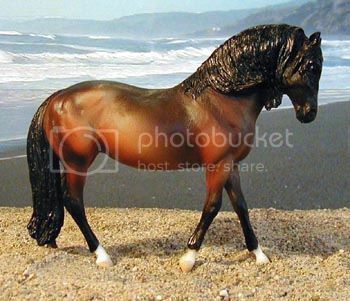 Model information: Breyer Stablemate scale G2 Andalusian mold; JAH Special Edition Stablemates Gift Set, special run for Breyer's magazine Just About Horses in 1998, 5,000 sets produced. Lines to Maluso, Adalid. Sire has multiple champions and NAN qualified. 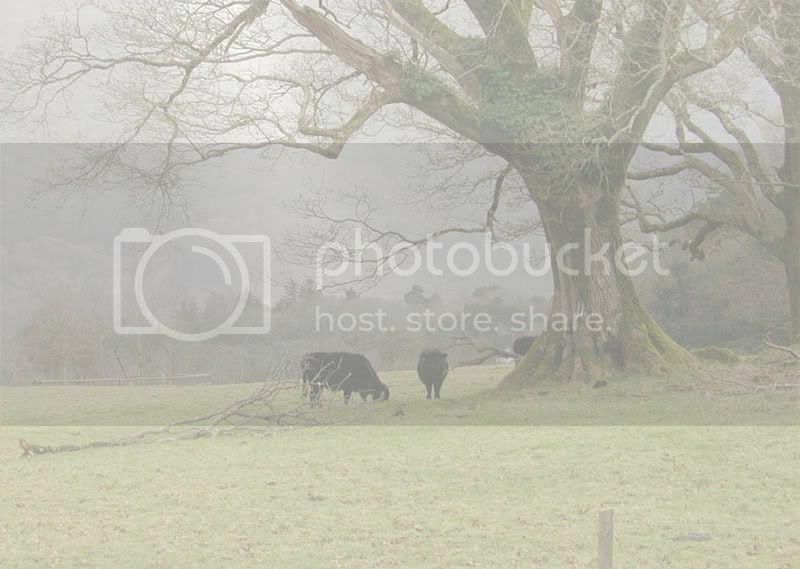 Awards: Photo show placed, has achieved Premier Champion status with IMEHA. 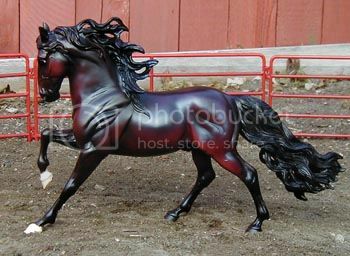 Model information: Breyer Andalusian mold; #710104 "Nobel II", 2004 Breyerfest Celebration Horse; 4,500 produced. Lines to Adalid, Genil. One grandsire has multiple championships and is NAN qualified, other grandsire is a photo show champion. 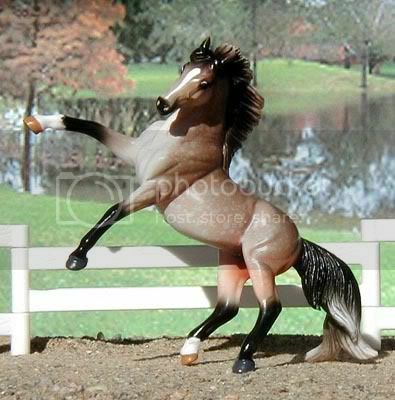 Model information: Breyer Classic Andalusian Mare mold; #61009 Classics Show Award Set, produced 2002-2005. 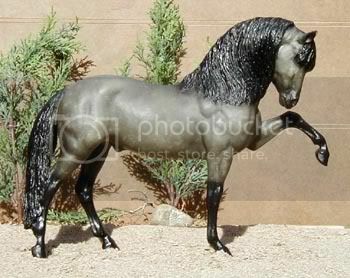 Model information: Breyer Classic Andalusian Stallion mold; #610 Classics "Flicka and Cougar" set, produced 2006-current. Lines to Genil, Nevado III, Bilbaino III, Jecomias. Sire is a photo show champion. 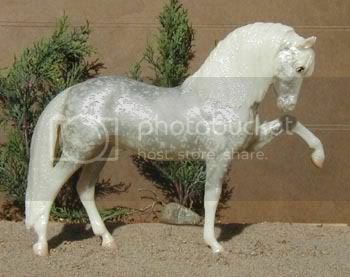 Model information: Breyer Classic Andalusian Mare mold; #670 Bay Andalusian, produced 2003. Lines to Jenson. Sire is a photo show multi champion. 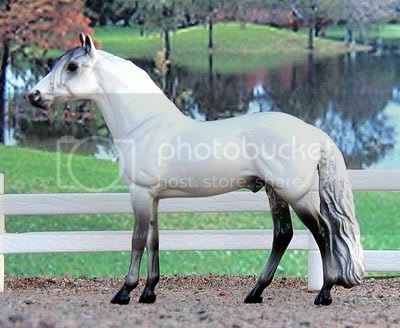 Model information: Breyer Classic Andalusian Mare mold; #3060 Classic Andalusian Family, produced 1979-1993.